Hubby decided to get mother in law, step son, little daughter and me to go and search for durians to eat. This is a durian daun or durian hutan from the aboriginals living near this kampung. The durian is smaller then the normal durian, green skin color and supposedly, according to the seller, the fruit only grows every 2 years once. The thorns are much more slimmer and sharper in comparison to the other durians. and the inside fruit is yellow in color and quite... nice..
My dear hubby decided to go on a spree then and ordered 4 durians and by the time I was done, I swear off eating anymore durians for the next 3 months!!! And they say durian is bad for your waistline and cause you to gain weight!!!! Anyway, do you know the benefits of eating durian? 100 grams of this fruit satiates about 21% of the daily carbohydrate requirement. Being a rich source of carbohydrates, it is helpful in replenishing your energy levels. Studies have proven that low levels of serotonin could actually trigger depression. Durian is naturally rich in Vitamin B6 which is essential for the production of serotonin. Hence, the intake of durian is advised to boost serotonin levels and thus, tide over depression. The presence of calcium, potassium and B vitamins in significant amounts makes this fruit beneficial for maintaining healthy teeth and bones. Vitamin C is found in abundance in this fruit. Vitamin C is a powerful antioxidant that helps to keep the oxidative stress prompted by free radicals at bay. The lower the oxidative stress levels, the slower the aging process. The presence of dietary fiber in durian helps in easing bowel movement. This in turn keeps away constipation and improves the power of digestion. The presence of thiamin and niacin improves appetite as well as digestive power, thus ensuring that your digestive system stays healthy. The presence of manganese in desired levels aids in the regulation and maintenance of blood sugar levels. Hence, it can be relished by diabetics without any fear. Durian is a good source of potassium which is required to keep the sodium levels of the human body intact. Regular intake of this fruit can thus ward off hypertension and associated medical conditions. Folate, if not present in adequate quantities, could lower the amount of red blood cells produced. This in turn can trigger anaemia. 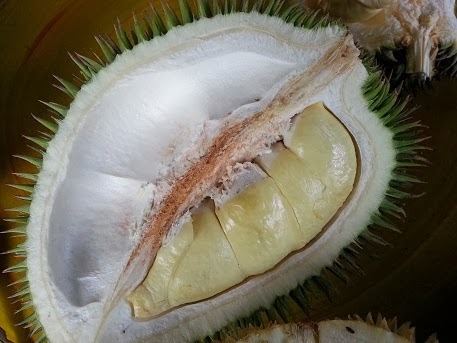 Durian is a good source of folate along with copper and iron. Hence, anaemic patients can tap the power of this fruit to overcome the health condition. 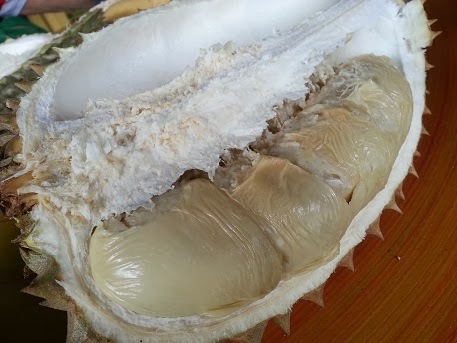 Durian is known to enhance libido. Thus, it helps in revitalizing your sexual life. I've never seen a durian. What do they taste like? I like my durians, every once in a while... =) thanks for visiting..